TILLING is an acronym for Targeting Induced Local Lesions IN Genomes. Materials are mutagenized populations that are likely to contain single nucleotide polymorphisms or small deletions. These changes in DNA may not have a recognizable phenotype in peanut, partly because of its polyploid genome. Mutant populations can be produced with commonly used DNA alkylating agents such as thylmethane sulfonate (EMS), although the treatment conditions for each species will vary. TILLING was developed with the model plant, Arabidopsis thaliana, as a method to screen for changes in the DNA sequence of a gene (McCallum et al. 2000). Prior sequence information therefore is required. The genome of A. thaliana was the first plant genome to be sequenced; however, relatively little sequence information currently is available for peanut. Nevertheless, DNA sequences of genes of interest, such as allergen genes, have been obtained (Ramos et al. 2006) and are being used to “till” for mutations. The first target, Ara h 2, is an intronless gene that is present in only two copies in the peanut genome. 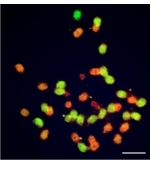 Peanut has a tetraploid genome where two distinct sets of chromosomes (red and green in the figure to the left) can be identified. These sets of chromosomes are derived from A- and B-genome putative progenitors which are most likely the diploid species, Arachis duranensis and A. ipaensis, respectively. Virtually all genes should be duplicated in these two subgenomes of peanut, hence each of the two Ara h 2 copies can be identified as A- or B-genome derived because of differences in their DNA sequences. Gene-specific primers allow us to “till” for mutations in either the A- or B-genome copy in separate reactions. A-genome mutants of Ara h 2 have been identified. 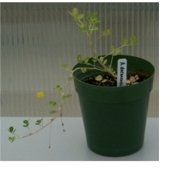 It will be necessary to combine mutant alleles from the two genomes in cultivated peanut by crossing in order to determine the function of the mutated genes by characterizing the mutant phenotype. A TILLING population will be a rich genetic resource for the peanut community, particularly when peanut gene sequences become more abundant. TILLING for natural variation is called Ecotilling (Comai et al. 2004). We have conducted Ecotilling for variation in Ara h 2 in the A-genome progenitor of peanut, A. duranensis (left). Five variant sites in the Ara h 2 gene have been identified that would lead to amino acid substitutions. The potential significance of one these changes for allergenicity was demonstrated. This work has been supported by multiple organizations: The Consortium for Plant Biotechnology Research, Georgia Peanut Commission, Peanut Foundation and National Peanut Board.